PYONGYANG, North Korea - All signs out of North Korea suggest the transition of power to Kim Jong Il's son is going smoothly, with no unusual troop movements and no buildup around the heavily fortified border, U.S. and South Korean defense officials said Thursday. Pentagon press secretary George Little said that as of Wednesday the U.S. military has not seen any unusual military movements by the North Koreans. 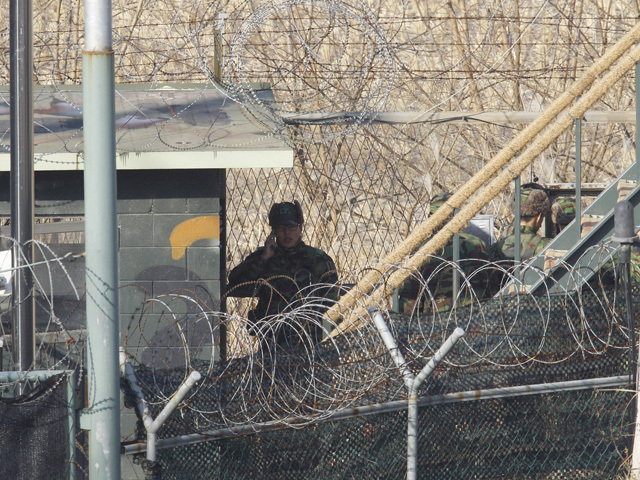 "This appears to be a relatively smooth transition on the peninsula, and we hope it stays that way," he said, adding that there have been no increases in force protection levels for U.S. troops in South Korea. U.S. Navy Capt. John Kirby, a Pentagon spokesman, also said the situation appeared to be under control. "Things are calm there across the DMZ right now. And that's the way we'd like to see it," Kirby said, referring to the Demilitarized Zone that divides the two Koreas. South Korean Defense Ministry spokesman Yoon Won-sik said North Korea's military isn't showing any particular movement and that the South's troops are operating normally. Ratcheting up its propaganda machine, meanwhile, North Korea claimed Kim's death generated a series of spectacular natural phenomena, creating a mysterious glow atop a revered mountain, cracking a sheet of ice on a lake with a loud roar and inspiring a crane to circle a statue of the nation's founder before perching in a tree and drooping its head in sorrow. North Korean media have presented a steady flow of dramatic scenes of mourning since Kim's death, which Pyongyang says happened on Saturday after he suffered a massive heart attack while on a train. Tens of thousands of mourners packed Pyongyang's snowy main square Wednesday to pay respects to him. Women held handkerchiefs to their faces as they wept and filed past a huge portrait of a smiling Kim hanging on the Grand People's Study House, in the spot where a photograph of Kim Il Sung, Kim's deceased father and the country's founder, usually hangs. A report late Wednesday by the North's official Korean Central News Agency said the odd occurrences began when Kim's death was announced on Monday and the nation went into mourning. State-run media have since the announcement run nonstop eulogies to Kim, who was the center of an intense cult of personality. "Peculiar natural wonders were observed on Mt. Paektu, Jong Il Peak and Tonghung Hill in Hamhung City, where the statue of President Kim Il Sung is standing at a time when all Korean people are mourning the demise of leader Kim Jong Il in bitterest sorrow," the report said. It said that on Tuesday a Manchurian crane was seen flying around a statue of Kim Il Sung three times before alighting on a tree. It said the crane stayed there for quite a long while with its head drooped before flying away in the direction of Pyongyang. "Observing this, the director of the Management Office for the Hamhung Revolutionary Site, and others said in union that even the crane seemed to mourn the demise of Kim Jong Il born of heaven after flying down there at dead of cold night, unable to forget him," it said. Behind the scenes, South Korean intelligence reports suggest North Korea is consolidating power behind Kim's untested, 20-something son, Kim Jong Un. But concerns about possible instability in a country with a 1.2-million troop military, ballistic missiles and an advanced nuclear weapons development program remain high across the region. South Korea has its military on high alert, and Chinese boatmen along a river separating North Korea and China told the AP that North Korean police have ordered them to stop giving rides to tourists, saying they will fire on the boats if they see anyone with cameras. Kim Jong Il ruled the country for 17 years after inheriting power from his father, who died in 1994. Kim Jong Un only entered the public view last year and remains a mystery to most of the world. South Korean military officials, who spoke on condition of anonymity because of office policies that restrict comment on intelligence matters, confirmed that North Korea has ordered its troops to be vigilant but said that doesn't mean they're being moved. South Korea's intelligence agency has told Parliament members that an ad hoc committee headed by the Workers' Party's Central Military Commission, in which Kim Jong Un is a vice chairman, is expected to handle key state affairs before he formally becomes the country's leader. The agency predicts Kim Jong Un's aunt Kim Kyong Hui, a key Workers' Party official, and Jang Song Thaek, a vice chairman of the powerful National Defense Commission, will play larger roles supporting the heir, according to a lawmaker who spoke to the AP. A South Korean Defense Ministry official handling North Korea affairs, however, said there is too little information to make a confident judgment about where North Korea's power transition is heading. According to a Defense Ministry report submitted to Parliament on Tuesday and leaked to reporters by South Korean lawmakers, some North Korean units conducting winter drills returned to base following the news of Kim Jong Il's death. It also said official mourning events have begun in a number of front-line bases across the country. The report did not elaborate. The young Kim led a procession of senior officials Tuesday in a viewing of his father's body, which is being displayed in a glass coffin near that of Kim Il Sung. Publicly presiding over the funeral proceedings was an important milestone for the son, strengthening his image as the country's political face at home and abroad. According to official media, more than 5 million North Koreans have gathered at monuments and memorials in the capital since Kim's death. The North has declared an 11-day period of mourning that will culminate in a state funeral and a national memorial service on Dec. 28-29.